Looks like Bollywood is painted in Lilac! The new colour trend is back with a bang and the designers are just going gaga over it. Lilac, the royal and luxurious hue is here to rule and have its moment. The colour is not only flooding celeb wardrobes but the runways as well. [post_ads]For several years the shade wasn't preferred by the majority . But now its here to make you feel regal and elegant. 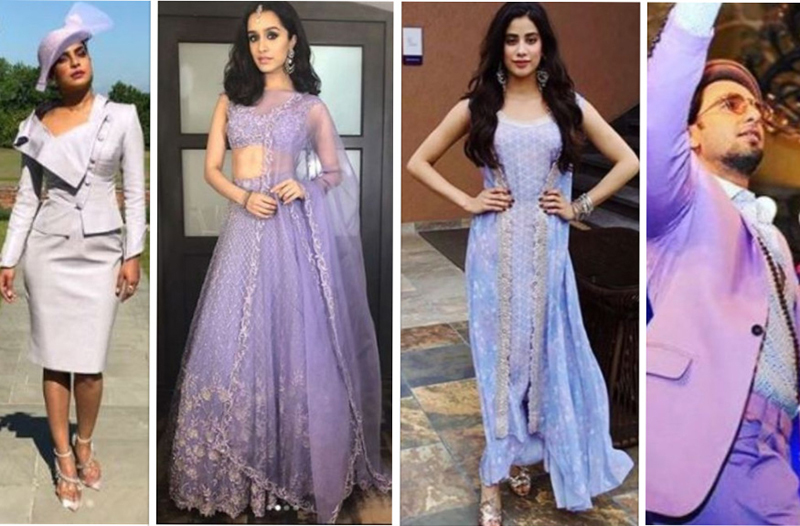 The lovely pastel shade is inspiring Bollywood celebrities and each of them is definitely winning the lilac game. From the very recent Sonam Kapoor Ahuja's stunning shehlaa khan saree to our desi girl, Priyanka Chopra’s rocking Vivienne Westwood lilac skirt suit to Ranveer Singh's all lavender suit, the audience is drooling over each of their's lilac fashion statements. This trending hue is onboard and is creating a good balance between watery pastels and deeper jewel undertones. Priyanka Chopra is an icon when it comes to her impeccable style. Priyanka turned heads rocking a Vivienne Westwood lilac skirt suit at Harry's and Meghan's royal wedding. Watch her slay! Shraddha Kapoor dazzled and looked a stunner in her lilac embellished lehnga by Krisha Bajaj. The graceful jewellery and wavy hair just complimented her look at Ambani bash in Mumbai. Jhanvi Kapoor made everyone's heart Dhadak in each of her public appearances. The lilac tunic and cape by Ritika Mirchandani that she wore in one of the promotional events had everyone drooling over her. Ranveer Singh has always been famous for his out-of-the-box fashion statements. At One of the events organised by CNN-News18, he looked absolutely dashing in his all lavender suit by the designer Varoin Marwah.